When the main character of the film Miss Peregrine’s Home for Peculiar Children, Jake Portman (Asa Butterfield) was a boy, he was told stories by his grandfather, Abe Portman (Terence Stamp) before he went to bed each night. Now an awkward teenager working at a grocery store, Jake frequently visits his grandfather who now suffers from dementia. One day when he visits him however, he realizes something terrible and peculiar has happened to him as he finds his grandfather lying on the ground fatally wounded. Jake kneels down to his grandfather Abe as he is dying, and his grandfather tells him what he must do to learn who he really is. Jake’s grandfather also apologizes in those last moments, saying he should have told Jake much sooner of his true destiny. Jake is confused and shocked as to what he saw that night and who, or rather what it was that had killed his beloved grandfather. Nobody believes Jake and his parents think he has acquired a mental illness, like his grandfather. Having people think he’s mentally ill only further alienates Jake, who doesn’t quite fit in with other kids at school. So to prove them all wrong and find out his destiny, Jake is fueled by the mysterious last words his grandfather says to him, and goes on an adventure to find out what his grandfather wanted him to know. This journey leads him to Miss Peregrine’s Home for Peculiar Children, a place that he thought his grandfather had made up when telling him stories as a boy. In learning that Miss Peregrine’s home and it’s inhabitants are in fact real, Jake also learns he does indeed have a purpose, a rather peculiar one at that. Jake sets out on a journey to save those peculiar children from antagonist and mad scientist gone wrong Barron (Samuel L. Jackson), while discovering and appreciating his peculiarities. The film is directed by Tim Burton and based on the novel of the same name by Ransom Riggs. 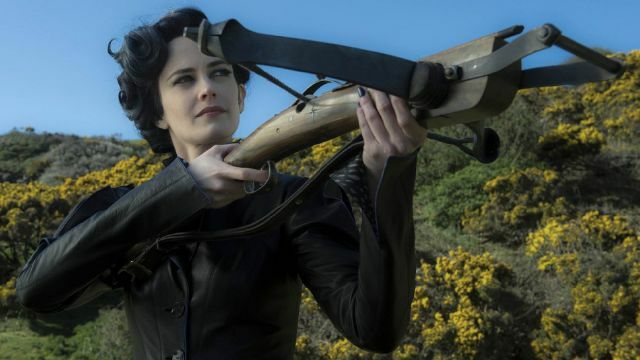 Akin to Burton’s style of unique and lovable characters in a mystical, fantastical and creepy and surreal setting, Miss Peregrine’s Home for Peculiar Children includes wide range of special effects. To evoke the special powers of the peculiar children and where they live, special effects were used to create a skeleton battle, an underwater scene, and monsters. And these special effects are only enhanced and more life-like when the film is viewed in 3D. Fight scenes, characters in the foreground, and many of the special effects pop out to the audience. Of the many attention-grabbing scenes in the film, one that was poignant to the plot and made visually stunning by its special effects was an elaborate fight scene where Jake and the Peculiar Children battled against Barron’s henchmen on a snowy dock. The dozens of skeleton men brought to life to fight for Jake and the Peculiar Children were stunning. Once the movie progresses it becomes enchanting and fantastic. The film takes the audience along with Jake on his heroic journey where he traverses distance and time in search of fulfillment and purpose. Butterfield does a wonderful job portraying Jake as he discovers himself and battles Jackson who commands the evil role he plays as Barron. There were many motifs in this movie like being peculiar, self discovery, and adventure, but two universal themes really stood out in the film. The primary theme of the film is that no matter how the odds may be stacked up against you, if you put your mind to it, you can achieve anything and even defy people’s expectations of you in the process. The secondary theme is that being peculiar or slightly different from everyone else can be a wonderful thing that should be appreciated rather than hidden. Even an unexpected, oddball underdog, like Jake, could end up being the hero that saves everyone in the end while finding his place in the world.hip-hop and real-world issues.